Modern reading and books, in all forms, like the great library of Alexandria, face coming to an end from indifference. Today's public lacks a background in the classics. 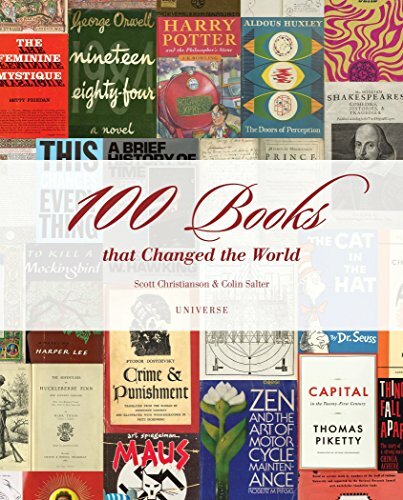 Books like Scott Christianson's and Colin Salter's 100 Books that Changed the World could introduce some people to what they have missed. Reading through this heavily illustrated book makes for an entertaining evening. The authors' "list is drawn from every age, in every style, on every subject" with works that "carry new knowledge forward into the future." Books should not be judged by their covers although they "can be exquisitely beautiful objects." The authors outline the basic changes in creating moveable type "printing had the same world-shrinking impact as the development of the Internet." Christanson's and Salter's choices include "fifty that everyone would agree should be included." After that, "so how do you choose?" They judged the selections purely on what changed society, no matter literary merit, including Mrs. Beeton's Book of Household Management (1861). Fiction and nonfiction works receive note. 100 Books includes Remarque's All Quiet on the Western Front but also Persing's Zen and the Art of Motorcycle Maintenance. The familiar and little known have essays such as Machiavelli's The Prince and, by contrast, Achebe's Things Fall Apart. "Each of these works benefitted from the exchange of ideas in books, combined with the insights of their own particular genius." Each brief essay, almost a museum item display card, has a description, a brief history, and some justification for the book's inclusion. The authors offer no documentation but the reader can find that on the Internet or, better, in a real library. On a broader scale, the authors wish that their contribution "makes you question your own choices or ours, or introduces you to a book." "Literature makes magic across the millennia" and words, even in the form of illustrations, are "powerful in many ways: evocative, emotive, persuasive, prescriptive informative, misleading, lyrical, musical, incomprehensible, revealing." This collection would make a great item to place on some deep space probe for other intelligent life to use to learn who and what we are. It would also make a great survey literature course with an essay assignment that asks why these works collectively matter and what they mean.